Ice covered decidous trees and bushes create an instant winter feel for miniature scenes. This quarter scale version is made from sections of dried weeds, combined into a multi stemmed 'tree', given an few berries, and coated with several coats of clear glaze to build up an ice layer. The technique will work with all scales of miniatures, but is especially effective where light will shine through the faux ice layer. If you need more ice for building edges, you can make them from the same materials as the ice covered tree, using the instructions for making miniature icicles. To make miniature deciduous trees from weeds, you need to find sections of dried plants that have multiple branched stems, in scale with your particular scene. Keep an eye out in your garden, or on walks during the fall and winter and you will often see great candidates for your miniature scenes. Take the clean, dried material and work out how tall you want your miniature deciduous tree or bush. Cut the weed into sections, leaving one long branch at the top of each section if possible. Set the sections into a piece of dry floral arrangement foam with the branched sections facing out from the center to make the most realistic miniature tree grouping. Use sharp scissors to prune any branches that look too long or out if place if necessary. If you are completely happy with the way your miniature tree looks, you can either finish it with an icy coating, or simply glue the base stems together with pva glue to make a small tree. Leave the sections sitting in the dried floral foam while the glue on the trunk dries. If you will be making an icy coating for your tree, don't worry about gluing the 'trunk' together. If your weed sections are very fine, a coating of glue or glue and paint with strengthen your miniature tree. To begin making an icy coating for your miniature tree, take a fine paintbrush and lightly coat each section of your weed with a thin layer of clear acrylic varnish, gloss acrylic medium , or a dimensional PVA / acrylic glue like Sakura's 3D Crystal Lacquer. Take care to brush a thin coat of your glue / varnish /lacquer on all branches. If your coating starts to bead up, brush it out to prevent beads from forming. Take care to avoid pools of coating forming at the joins of branches. Coat the base of your tree or bush so that the sections of the model tree will glue together as the coating dries. Allow the coating to dry. Once your initial coating is thoroughly dry, add small beads beneath the branches if you wish to mimic fruits or berries. For my quarter scale tree I am using the smallest available microbeads. Look at examples of the type of tree you hope to mimic, and add your beads where you would expect to find fruit or berries, in groups or alone. Usually the fruits will be below the branches. For the quarter scale tree I set my brush into a bit of my clear glaze coat then picked up individual beads and transferred them in the glaze coat, to the bottom of the branches of my tree. Allow the beaded branches to dry thoroughly. Several thinly applied coating layers make a realistic ice effect for a quarter scale deciduous tree made from dried weeds. To finish making your ice covered tree for a model scene, continue to add layers of gloss acrylic varnish or artist's medium to coat the branches of your dried weed based tree. Keep brushing out the layers to avoid build up of overly thick coatings at the junction of the branches, and check to make sure your coatings are brushed out thoroughly completely along the branches and do not 'bead up'. Allow the finish to dry completely between coats. The quarter scale tree shown here had a single layer of gloss acrylic varnish applied before the beads were added, then three additional layers of the gloss varnish were applied. If you wish, you can add a sprinkle of microglitter or fine irridescent / clear or white embossing powder.to the crotches of your tree brancheds or the upper surfaces of horizontal branches, to give the effect of snow on ice. 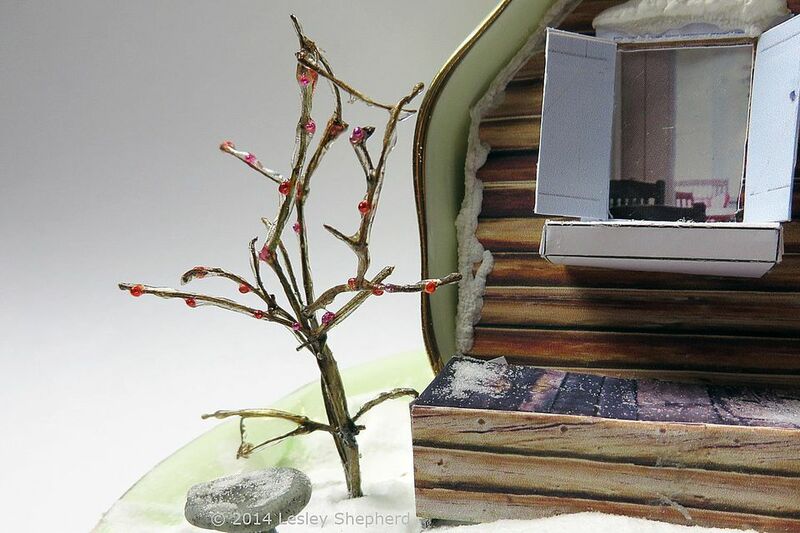 See the links in the link boxes below to find the other sections of the miniature cabin in a teacup winter scene used as a backdrop for this miniature.